Last week at the fall meeting of the American Geophysical Union (AGU) the science team of NASA’s OSIRIS-REx mission presented their first findings from the asteroid, Bennu. As expected, the spacecraft had uncovered evidence of liquid water in Bennu’s past. “The findings are really, really exciting for us,” said Dante Lauretta, the mission’s principal investigator, at a press conference revealing the early results. “We targeted Bennu precisely because we thought it had water-bearing minerals.” Water on Bennu, Lauretta and other team members say, suggests the asteroid also contains carbon-rich organic material pristinely preserved from the dawn of the solar system. Whether Bennu actually harbors such organics remains to be seen. But the discovery of hydroxyls—molecules bonded with hydrogen and oxygen—is a promising start to the mission’s science phase. In 18 months OSIRIS-REx will attempt to collect a sample from Bennu’s surface for shipment back to Earth, although initial images of the asteroid’s gnarly, inhospitable terrain have cast doubt over how achievable this goal is. Until then the spacecraft will map the asteroid extensively in order to find an accessible sample site as well as unravel the detailed history of an object made up of material older than the solar system itself. The primary tools for that job will be the two onboard spectrometers: OTES, which studies the asteroid’s thermal emissions, and OVIRS, which examines the space rock in visible and infrared light. A month before the AGU conference I am spending time with Lauretta and the rest of the OSIRIS-REx science team for the mission’s first spectroscopic glimpse of Bennu. The then-unknown evidence of ancient water existed at the time only as a thin beam of 0s and 1s—a 120-million-kilometer tether connecting OSIRIS-REx to Station 54, a giant radio dish in Madrid that is part of the Deep Space Network for interplanetary communications. That data stream from the distant asteroid would further travel from Spain to the Michael J. Drake Building of the Lunar and Planetary Laboratory at the University of Arizona in Tucson. Named for a late founding father of planetary science and of OSIRIS-REx, the Drake Building is nondescript and tucked away off-campus in a quiet residential neighborhood on the north side of Tucson. Yet on the morning of November 5, 2018, it may well be the planet’s epicenter of planetary science activity, housing dozens of frenzied scientists poring over fresh imagery just sent back from Bennu. In his office Lauretta marvels at the asteroid and its myriad features, the alien geology displayed on a large wall-mounted screen. 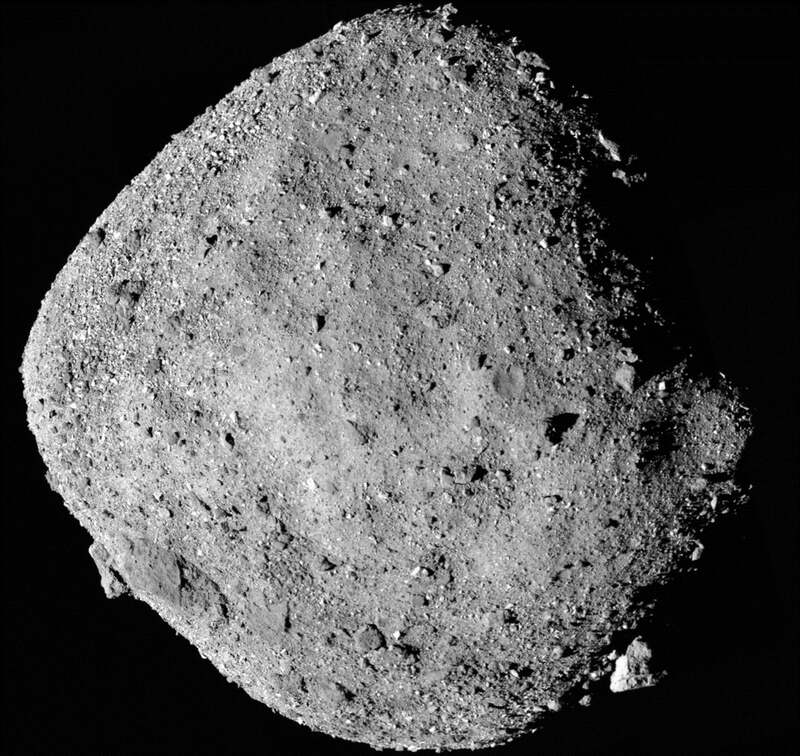 From an altitude of a hundred kilometers, Bennu is vaguely walnut-shaped and speckled like amphibian skin, a chaotic assemblage of light and dark patches with spots of fine-grained smoothness set in the asteroid’s rugged terrain. There are basins and depressions, and Bennu’s surface is strewn with boulders. The team expected to find one boulder on the order of 10 meters; instead, there are hundreds. Throughout the morning members of the OSIRIS-REx science team crowd his office for meetings or informal sneak peeks at the newly unveiled faraway world. When the mission was first proposed, Bennu existed as a point of light through a telescope, and for years that was the team’s reality. Now, however, they see something real, something with three dimensions and personality—something grittier and more rugged than anticipated. It is exciting. It is terrifying. Bennu is not as harsh as Ryugu, another asteroid with a robotic visitor—the Japanese probe Hayabusa 2 will attempt to retrieve samples there once mission planners are confident it can do so without scuttling on Ryugu’s unwelcoming surface. Bennu appears younger; there are few obvious impact craters. Lauretta is also a member of the Hayabusa 2 team, and the tribulations of the one mission inform the other. And he is proud of his asteroid. “Ryugu is featureless from an albedo, color and spectral perspective,” he says. “Bennu is interesting.” And its dark patches, he says, are particularly promising. The OSIRIS-REx science team hoped to find dark, carbonaceous material on the object because such stuff may have been the feedstock for planets coagulating from the disk of gas and dust that was the embryonic solar system’s celestial womb. And there it seems to be, scattered haphazardly across the asteroid’s surface. The darkness is not shadow; the sun is almost directly behind the asteroid in the images. But it could just as well be a mirage, a compositional chimera produced by the scattering of light just so from fine grains on the surface. No one yet knows. As tedious as it may seem, it is worthwhile to worry about how granular Bennu’s surface is, because the entire mission’s success may depend on it. There is insufficient data as yet for confirmation but the OSIRIS-REx team had predicted Bennu’s surface would be dominated by centimeter-scale particles. Thus, centimeter-scale particles are what its sample-gathering robotic arm, TAGSAM, was designed to collect. A sample-collection mission unable to collect samples would be disappointing. Prediction is hard, Niels Bohr once said, especially when it is about the future—or in this case, when it concerns something no one has ever really seen. Everything previously known about Bennu’s composition came from telescopes incapable of spatially resolving the asteroid. Until now it has been, at best, like looking at a peak on Tucson’s ridge-ringed horizon. You see the outline—there exists a mountain—but no more. You must venture much closer—to stand on it, to see its rocks, cacti, desert lavenders and velvet mesquites. At Bennu, OSIRIS-REx is humanity’s proxy mountaineer—its onboard camera instrument and spectrometers our eyes, revealing to scientists the true nature of this relic from deep time. None of this may seem important—old rock, ancient water, maybe organics… so what? But in studying the history of this solar system, those ingredients are everything. Organic material and water are essential to life on Earth. But nobody knows for sure where they came from, how they got here. Did they appear at the same time as the formation of our sun or were they delivered by comets and asteroids only after Earth and its planetary siblings had formed? Bennu and its brethren hold the answers because they are believed to be chemically unaltered from our solar system’s genesis. The asteroid Bennu that OSIRIS-REx studies today, it is thought, is essentially the same Bennu that existed four billion years ago. NASA is not flying a spacecraft, it is flying a time machine, and its purpose is to figure out where the stuff of life—bacteria to brontosauruses—came from. NASA has never sampled an asteroid before, and it might be a very long time before it samples one again. It is not enough to rashly grab any old scoop of rock and rocket back home. The agency needs to learn everything humanly and robotically possible about Bennu—needs to understandevery square centimeter of it—so that whichever spot the spacecraft samples is the best place scientifically for answering so many crucial questions about the beginning of everything under the sun. Long after everyone involved with OSIRIS-REx is dead the samples taken will continue to be studied. As humanity’s understanding of the solar system matures, a little bit of Bennu can be revisited endlessly for the price of a plane ticket. So sample-site selection is an almost Confucian correspondence between generations. The spacecraft’s instruments work together in service of choosing a worthy sample target, but only its spectrometers, OVIRS and OTES, can answer the critical questions about composition. Each is designed to complement and affirm the findings of the other. Pictures reveal extraordinary geologic features, but what, exactly, are they made of? Is this the material we need to bring home and crack open in a laboratory? So important are spectrometers to this interplanetary mission that it is the first-ever to carry not one, but two onboard. 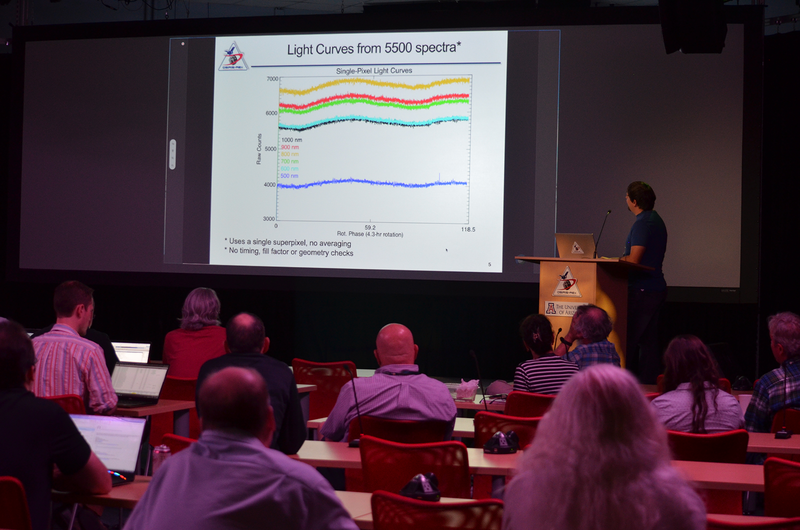 OVIRS measures light from the sun reflected from Bennu. OTES measures thermal energy radiated by Bennu. (The asteroid is like a hot rock on a summer day; put your hand near it and you feel the heat—that emitted heat is what OTES is measuring.) In both cases the resultant spectral measurements, plotted as waves on graphs, suggest which minerals are present. OVIRS is better with small particles and organic molecules—grimy films, grains of sand and minerals—in large part because the relatively short wavelengths of visible light yield higher resolutions. OTES is better with bigger, bulkier things that can absorb and re-radiate lavish levels of longer-wavelength infrared light—again, think of hot rocks. If OTES sees a certain mineral, OVIRS should see it, too; a disparity between the two can reveal subtleties of particle size and composition useful for diagnosing the true state of things on Bennu’s surface. The spectrometers are not penetrating deeply into Bennu’s heart; OTES can thermally probe only to a depth about five times the width of a human hair. OVIRS can see only to a single human hair width. During the sampling event in 2022, OTES will be active as the spacecraft approaches Bennu and presses into it, and will remain in operation as the spacecraft backs away. “Assuming we don’t get dust all over our telescope, we should see what’s underneath that surface,” says Vicky Hamilton of the Southwest Research Institute in Boulder, Colo., and the leader of the OSIRIS-Rex Spectral Analysis Working Group. “It will tell us something about the uppermost surface of Bennu and the timescales of change,” she says. “We know asteroid surfaces are space weathered. But is Bennu space weathered all the way in, which implies particles are constantly moving around, constantly exposing new things to the sun and micrometeorites? Or is it relatively stable, with only the outermost surface seeing the effects?” she notes. This, again, tells scientists something about the goings-on billions of years before there was such a thing as Earth, or Mars, or the sun as we know it. 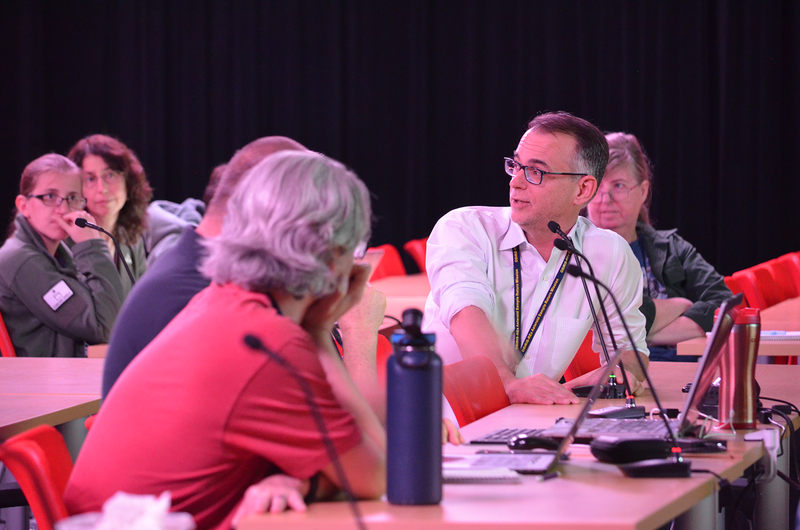 That afternoon, with data done trickling from the heavens at light-speed into the dishes of the Deep Space Network, the OSIRIS-REx team holds an all-hands “Daily Downlink” meeting. There were 43 people present on November 5, not counting the substantial numbers of remote participants virtually participating from around the country. “I know the whole building is buzzing,” Lauretta tells the group. “I didn’t sleep well last night because I had to keep getting up and looking at the images.” On one standout slide, Bennu is rendered Magic-Eye-style, so that with a bit of eye-crossing focus it will suddenly spring into three dimensions. The spectroscopy data—arcane squiggles on line graphs—still have a long way to go before being ogled for any beautiful mysteries revealed. No one will ever make spectroscopic Magic Eyes. For now the signal-to-noise ratio is excruciatingly low. The spectrometers were designed to observe Bennu from a full field of view, the way the moon might take up the entirety of a backyard telescope’s viewfinder. But because the spacecraft is still so far away, Bennu is filling only about 40 percent of the frame; in addition to the asteroid, the spectrometers are taking readings from deep space. Even having teased tantalizing results from the data, the month following that first full-frame spectroscopy download involved not “eureka!” moments concerning Bennu’s makeup but rather laborious calibration of the data sets returned. The spectrometers are sensitive: they get too warm and the results are skewed; some voltage is off and the results are skewed; they suffer weathering effects of deep space and the results are skewed. “You don’t want to just run your data blindly and start interpreting science out other end,” Hamilton told me later by phone. Calibration and the blessing of data are aimed, she says, “at making sure nobody, in overexcitement and not knowing everything about how an instrument behaves, goes off and interprets something that is not real.” The instruments are pointing either at Bennu, deep space or, in the case of OTES, an internal calibration target. Known signal variations reveal the state of the instruments. So far, both spectrometers have proved nominal. And yet it entices. When OSIRIS-REx presses TAGSAM into Bennu, it will be tilling and taking the soil of a celestial Garden of Eden. The mission itself is practically written in verse; humans dug up the metals and minerals of this world and fashioned a tool to dig up the materials of another. Far into the future scientists will slice into the spacecraft’s quarry and look deeply into our past. And in the spacecraft studying the composition of an asteroid, we see most of all the stuff that humanity is made of.